I wonder where the Batuu time line sits in the Star Wars Universes as I didn’t expect Han Solo to be alive. 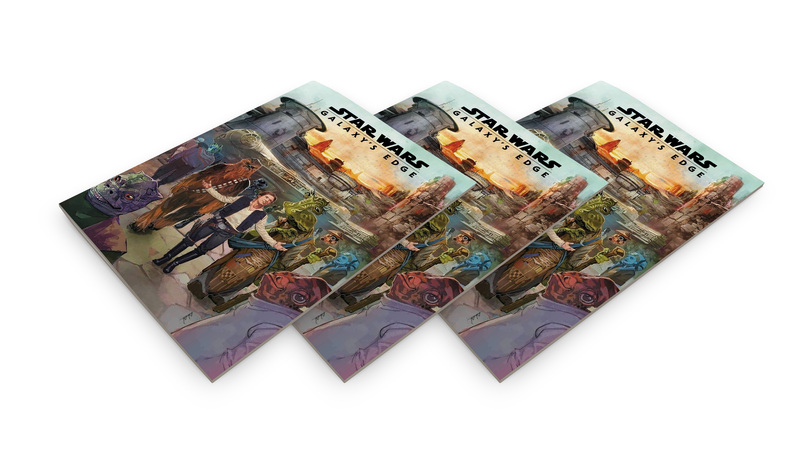 As hotly anticipated as a new Star Wars film, the upcoming Star Wars: Galaxy’s Edge themed land will not only welcome visitors to its wonders later this year at Disneyland Resort and Walt Disney World Resort, but also encompass a stunning new Marvel Comics limited series! Launching on April 24, writer Ethan Sacks and artist Will Sliney present the five-issue STAR WARS: GALAXY’S EDGE! 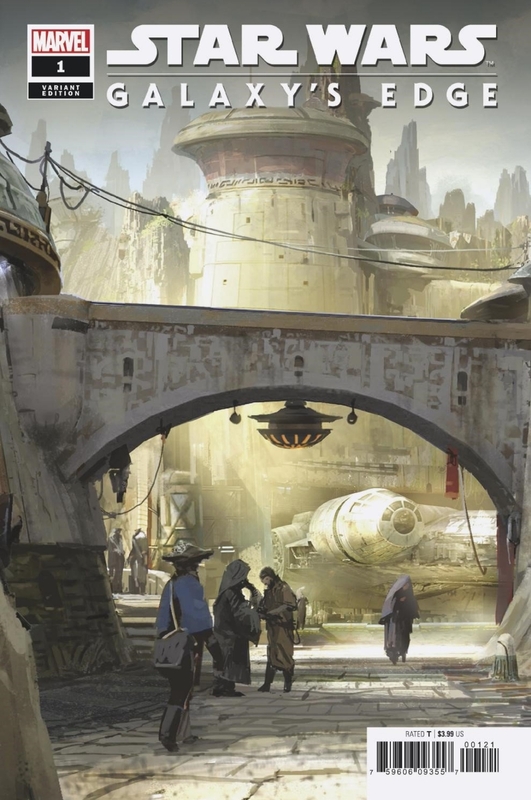 Black Spire Outpost has long been frequented by smugglers, merchants, and travelers from every corner of the galaxy looking to make their score on the infamous black market—or experience the exotic thrills only the remote world of Batuu has to offer. Beings like the infamous Dok-Ondar, a proprietor of rare and one-of-a-kind antiquities, thrive on the unique opportunities which abound on the lawless outpost at the very edge of Wild Space! But the evil First Order has come to Batuu and the survival of the entire outpost is at stake! Marvel.com: We can only imagine. Now, assuming you worked not only with your Marvel editors, but with Lucasfilm, too, what was that process like? Sacks: It’s so interesting to work with Lucasfilm, or the Jedi Council as I secretly call them, because the Story Group is so dialed into the little details. They are the keepers of the flame and generous with their guidance. Getting to see behind the curtain, like the top secret maps and concept art for the land, was a true privilege. On the day to day, though, Mark and Thomas, my Marvel editors, do the heavy lifting of keeping me on track. Marvel.com: How would you quantify Black Spire Outpost in a nutshell? How is it different from, say, Mos Eisley? 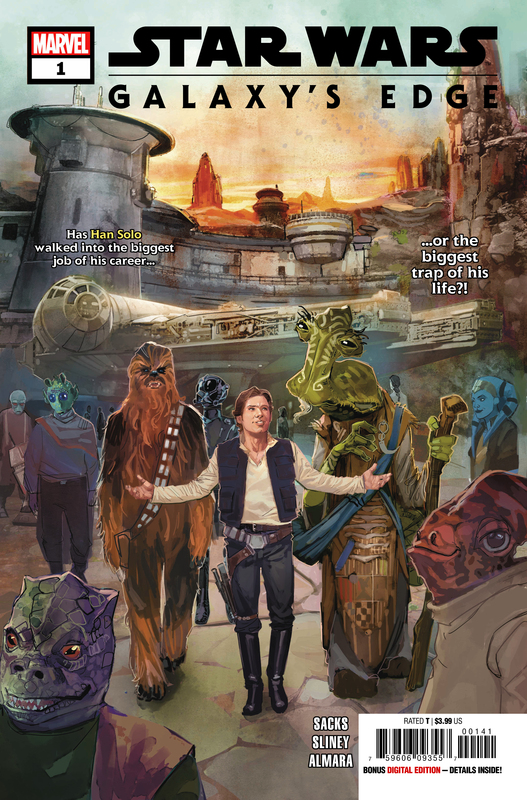 Sacks: Mos Eisley always felt a little backwater to me. The only reason why there was any Imperial interest in the place was because of that pesky R2 unit. Sacks: Black Spire Outpost, meanwhile, is more the last major stopover for the galaxy’s riff-raff on the maps. I’ll leave any details out of it for now, because I think readers will enjoy discovering the place for the first time. Marvel.com: Likewise, what’s your snapshot of your main character, Dok-Ondar? How does he make for an engaging lead for this story? Sacks: Dok-Ondar is an Ithorian, and there is a lot going on inside that hammerhead of his. He didn’t get to his position as the procurer of the rarest relics in the galaxy just because he’s lucky. He’s always three dejarik moves ahead of everyone else. He’s been at this collecting thing for a while, which has meant crossing paths with a number of familiar faces over the years. 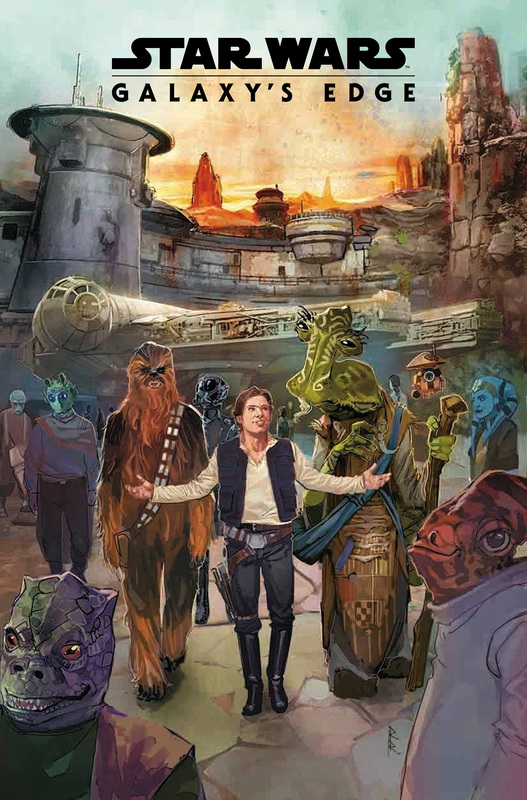 Marvel.com: Now here’s something really cool—we see that Han Solo has a role to play in the series’ backstory. 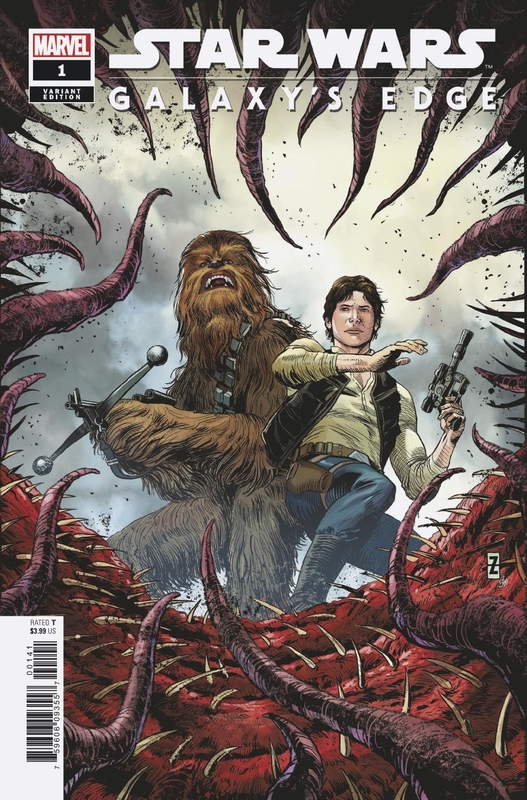 What’s the most exciting thing for you as a writer about utilizing him and Chewie? Sacks: These are characters that have been a part of my life since I first sat in a darkened theater at the age of four in the summer of ’77 and watched that opening crawl for the very first time. Even at the height of my vivid childhood imagination, playing with Kenner action figures in my room, I never imagined I would get to put words in their mouths—or, well, roars in their mouths—and have it actually be in canon. Amazing. Marvel.com: You’ve also got the dreaded First Order arriving at Black Spire; what’s that like for its denizens? Sacks: The First Order has not conquered all of this part of the Outer Rim yet, but they’re a dominant presence in the outpost. They are chasing down reports that the Resistance is hiding on the planet, and as long as their Stormtroopers are stationed there, they pose a potential threat to the smugglers, bounty hunters, criminals, and other scoundrels that are passing through. Marvel.com: Did you get to create new characters as well as work with existing Galaxy’s Edge characters? Marvel.com: Incredible. And since you opened that channel, what’s it been like working with Will on this? Sacks: After his work on SOLO: A STAR WARS STORY ADAPTATION, is there any doubt that he was probably born on Mandalore and just pretends to be from Earth? 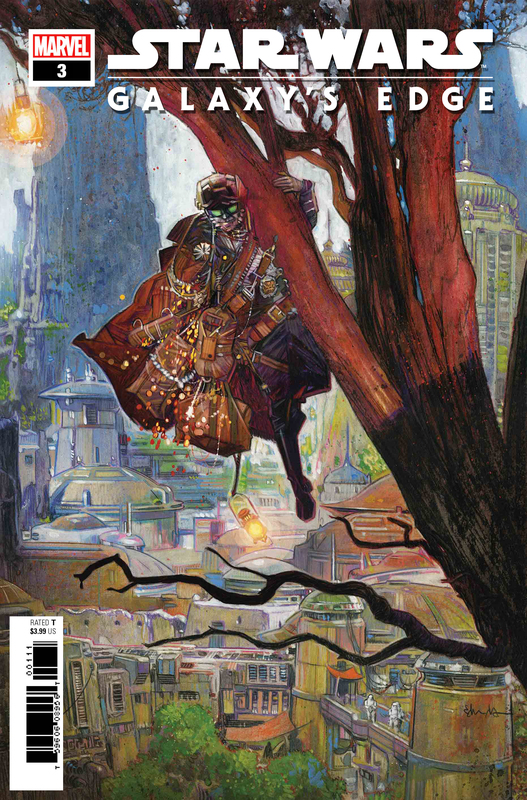 Seriously, though, the guy can flat out draw anything and is just a great collaborator. 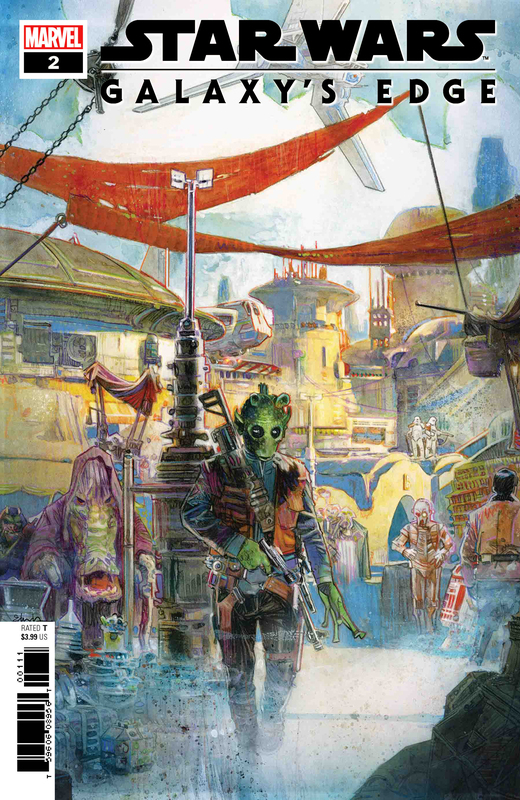 The look on this series is everything, because this is the first time that readers will see large swathes of the Black Spire Outpost, and Marvel got the right guy to give them the tour. Marvel.com: We’re heading out now, so give it to us in Star Wars-ese, please. Sacks: I am the Nien Nunb to his Lando.